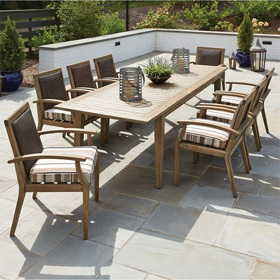 Built with traditional style and modern durability in mind, the Cortland Padded Sling Outdoor Dining Set for 6 by Woodard is the perfect choice for your outdoor dining area. This set invites six to sit down in stylish dining chairs with padded sling seating guaranteed to stand up to the elements and every day wear and tear. For added luxury, the dining chairs offer high backs to accommodate taller individuals. The dining table in this set features concentric circles for uniformed appeal and an umbrella hole for adding a source of shade. All furniture in the Cortland collection features seamlessly welded aluminum frames. Unlike most metals, aluminum will not rust making in the perfect choice for pools and coastal areas. Dining Chair 25.5"W x 32"D x 41"H 23 lbs. Table 54"W x 54"D x 28"H 64 lbs.